We have some exciting news for all of our Facebook Fans! We are going to start running a weekly contest for CG Girl of the Week. All you have to do to enter is Become a Fan of CG on Facebook then post a picture or video of yourself in your Customized Girl gear and tell us what your favorite part of your design is. It’s that simple. Each week we will pick the person who has the most “likes” and they will receive a $25 gift card to CustomizedGirl.com. In the event of a tie we will send our CG team to our Facebook page and we will each cast one vote for our favorite story to break the tie. At the end of the month, we will pick one winner out of the previous 4 to win an extra grand prize to add to there $10 Gift Card they won earlier. 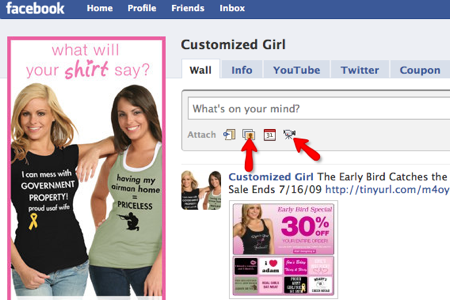 To post a video or a picture on the Customized Girl Facebook Page just click on the “post photo” or “post video” icon. If you are posting a picture make sure to type your story in the text box before you click on the “share” button. If you are posting a video, no need to worry about it just make sure you cover your story in the video that you shoot. To vote for someone’s story just simply click on the “like” button under their posting. Good luck to everyone! Now get out there and Show Us Your CG! Please refrain from posting any questionable or profane pictures. Each entry is up for review by the customizedgirl.com staff and any entry that we deem to be questionable or profane will be taken down and the eligible entry will not be considered for either the weekly prize or the grand prize. Must be at least 18 years of age to enter the Show Us Your CG Contest. By posting an image you are in agreement with these terms.